Hidradenitis Suppurativa can be particularly difficult to manage in people who are overweight. Being overweight, or gaining weight, can both trigger the condition in susceptible individuals as well as exacerbate the flare-ups in persons with the condition. 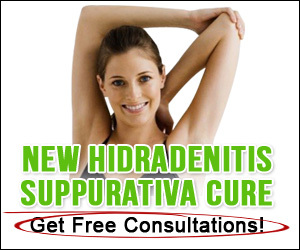 According to dermatologists, adopting healthy lifestyle changes that emphasize on weight reduction can help in controlling Hidradenitis Suppurativa and are integral in achieving remission. It has been seen that in some cases weight reduction helped in controlling the disease without any medications. Some other factors influence the growth of the disease, but being overweight can definitely worsen your condition and make it harder to treat. Carrying extra weight on your body increases the chances of rubbing of skin with the affected area and eventually spread the infection. Furthermore, overweight people usually sweat more, which also spreads the bacteria on the entire body. Moreover friction between body parts irritates the skin and can cause lesions in inflamed areas; these can subsequently get infected. In addition, losing weight will make your body more sensitive to insulin, improving the insulin resistance that is usually observed in the HS population. As a result, the body will need to produce less insulin in response to meals. This is beneficial because insulin peaks are known to trigger inflammation and flare-ups in HS, and by losing weight your insulin levels should go down. According to the experts, losing even 10 to 15 percent of the body’s weight could make a dramatic difference in your symptoms. Furthermore, the patient can easily avoid flare ups in the future by reducing their weight. Both diet and exercise are essential to losing weight and improving insulin sensitivity. One can start with just regular walks and cutting out ‘junk foods’ from the diet. Be careful to avoid exercise that will cause a lot of friction, such as wrestling. Cycling can also be problematic to persons who have HS in their groin area. You should also be careful with limiting saturated fats and sugars in your diet as much as possible. There are many ways, and diets, for losing weight; however, intermittent fasting is the best approach for HS patients. This is because beyond its effectiveness for weight loss, intermittent fasting has been shown to be extremely effective in improving insulin sensitivity. In fact, intermittent fasting is the most powerful natural insulin sensitizer known to science, making it the ideal diet protocol for HS patients. There are different protocol of Intermittent Fasting but the simplest is the 5:2 protocol. At its basic level, this protocol involves restricting calories on two non-consecutive days of the week, and eating normally for the other 5 days. Other protocols include the alternative day fasting for people who want faster results. Your dietitian will be able to plan a good intermittent fasting protocol for you. Alternatively, you can check out Brad Pilon’s highly acclaimed “Eat Stop Eat” manual, which is regarded by many as the ‘intermittent fasting bible’. It covers everything about this type of diet and gives you easy to follow meal plans if you would like to give Intermittent Fasting a try!